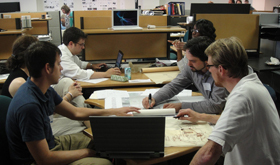 Working with a collboration of design professionals at the Eco Abet 2011 Summer Design Charrette, MOCK Studio has developed a masterplan for the ongoing development of the Switzer Community Farms in the Westside neighborhood of Kansas City, MO. The client for the project is Westside Community Action Network (CAN). With their input, the design collborative conducted a quick planning process to understand existing conditions, community needs, and each others ideas, then spent the rest of the day developing a whimsical yet realistic design strategy for the community farm.